Starting in the late 1990’s the Punxsutawney Rotary Club has been erecting a Christmas tree in Barclay Square each holiday season. 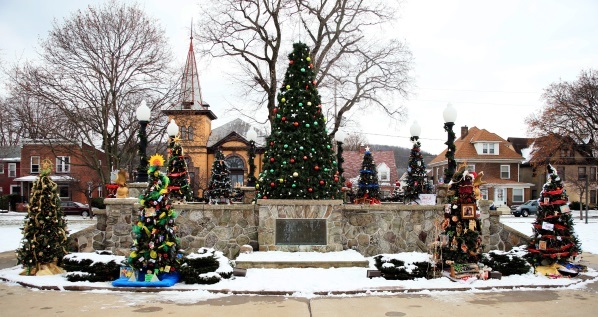 In 2006 the Rotary Club purchased an 18 foot tree with a 3-dimensional star and that year started a new holiday tradition of “Light-Up” night for Punxsutawney. During club discussions on how to better utilize Barclay Square during the winter season the concept of the Circle of Trees was developed. Thus, in 2007 the first event occurred. Since then, each year 19 trees are placed around and on the bandstand; all of which are decorated by a community group. It is amazing to witness how much interest in the program has occurred since starting in 2007. Making downtown Punxsutawney a wonderful spectacle for young and old is an experience the Rotary Club members hope creates memories for many years. Each day an untold number of people stop and walk around the bandstand. In fact it has even become a place for travelers passing through town as they see the trees and stop to look. Many of these same people use the opportunity to learn more about Punxsutawney and many even stay to sight see, shop and eat. Due to the generosity of several community minded businesses, Rotary receives a substantial amount of donations to fund the program. In fact, as with all Punxsutawney Rotary events, 100 percent of proceeds are returned to the community. Groups are paid a stipend to participate, $150.00 per group in 2013 and also compete for almost $2,000.00 in prizes; including $500.00 to the tree judged to be best overall.